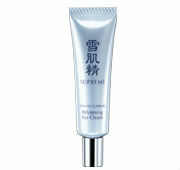 Provides concentrated care to eyes that are prone to dullness. Prevents blemishes and freckles caused by sunburn, creating bright eyes that shine from within. Provides deep moisture and translucency while preventing particular to the delicate eye area such as blemishes and dryness. Creates plump, firm and clear eyes. Calamus root extract and massaging accelerates blood circulation, bringing vibrancy and translucence to the thin skin around the eyes which is prone to bad circulation. The pure scent of oriental plants lets you relax during your skincare routine. Use as the last item of your skincare routine at night. *If your skincare routine includes cream, use this item after applying cream. Take a small amount on your fingertip. Apply gently from the inner to outer corner of the eye.